Old Port and Bathers Beach in Fremantle are part of an A-Class reserve and is the actual landing place of the first Europeans to settle on the western coast of Australia. The settlement’s first buildings were constructed here along with a jetty into the ocean to dock ships bringing much needed supplies. The crude settlement gradually evolved into a trading post and whaling station. Rich in history our commission was to rejuvenate the area by providing much improved public amenity and foregrounding the location’s historical significance. The location of site elements was dictated by an extension of Fremantle’s original city grid, acknowledging the urban industrial context of Old Port. After the preparation of a detailed heritage study and a conservation plan the old Kerosene Store was carefully repaired in accordance with the principles of the Burra Charter. Archaeological investigations revealed footings and walls of former structures and other findings. Public consultation was conducted and a concept plan prepared for further consultation and approvals, and establishing the project budget. All the timber used for the boardwalk, decking, terrace and mortuary lookout shelter was sourced form the demolition of Perry Lakes Stadium. 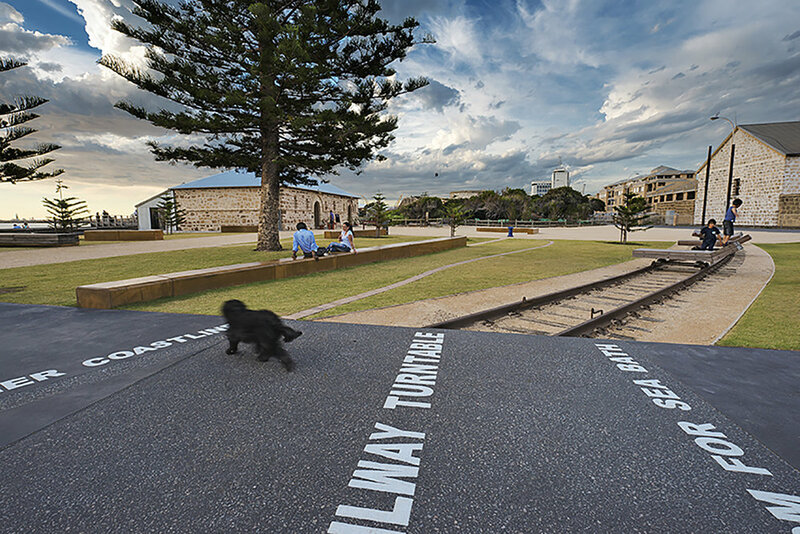 Full size pine trees were sourced and replanted at the site to provide shade and scale and to visually link the site into the character of this part of Fremantle.